Daily PCI Security Scanning : In order for www.israelbookshoppublications.com to qualify for the Security Scanned seal, they must pass a thorough daily scan of more than 75,613 known vulnerabilities, in accordance with PCI Security Standards. By successfully passing Trust Guard's daily PCI Scans, www.israelbookshoppublications.com is able to significantly improve the safety and protection of your information. Disclaimer: This certificate confirms that www.israelbookshoppublications.com has been tested for external server and security weaknesses by an Approved Scanning Vendor, and that no significant vulnerabilities were found as of the last successful scan date. While reasonable efforts are made to assure the scanning service is functioning properly, Trust Guard makes no warranty or claim of any kind, regarding the information or service provided. In addition, Trust Guard does not guarantee that the site is immune to hackers or that any data stored on the site is safe, and Trust Guard is in no way responsible for the security of or use of any of the information stored on a scanned site. 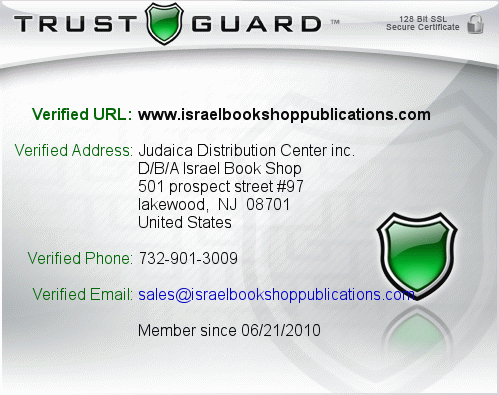 Security Verified : In order for www.israelbookshoppublications.com to qualify for the Trust Guard Security Verified Seal, we verify that their website is using at least 128-Bit SSL Encryption on pages where private information can be entered, such as credit cards, Social Security numbers, loan information, etc. and we monitor the SSL certificates expiration. Email Verification - An email is sent and received to www.israelbookshoppublications.com in order to confirm their support email address. 3rd Party Disclosure - This statement discloses what information www.israelbookshoppublications.com plans on disclosing to 3rd parties. Private Information Security - This statement informs you as to what type of security measures www.israelbookshoppublications.com has in place to protect you, and what they do with your private information (IE. credit cards, social security numbers, etc. ), after an order is placed. Email Usage - This statement refers to what type of email notifications www.israelbookshoppublications.com may send you after an order is placed. Certified: In order to receive a Trust Guard Certified Seal, www.israelbookshoppublications.com must meet all of the requirements for the Security Verified, Privacy Verified, and Business Verified Seals, plus a managing member of the company must have their address verified by Trust Guard, in addition to providing an additional phone number. All managing member information is kept private, however, it provides Trust Guard with alternative contact options if needed. We certify that the information we have received from www.israelbookshoppublications.com has been verified to the best of our ability, and that they have met all of the Trust Guard Verification requirements.